crochet | Stitch, Brinn, Stitch! 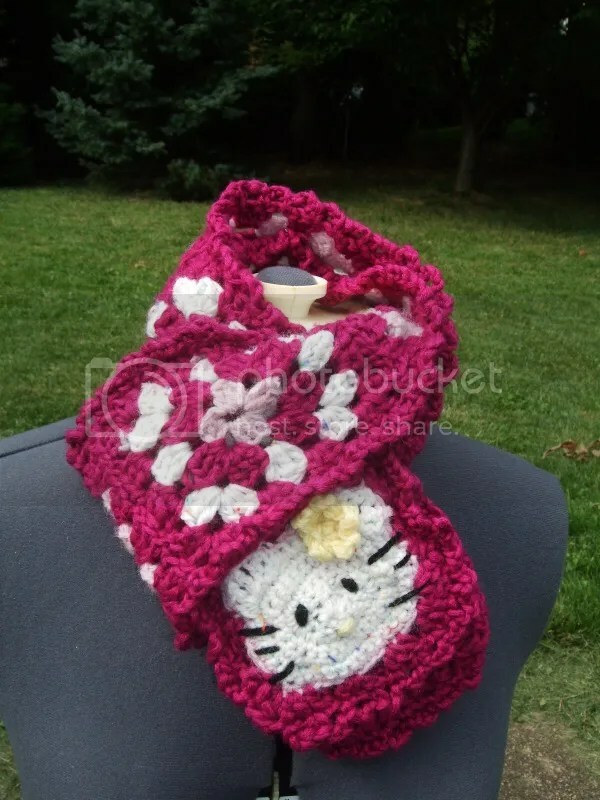 This one is crochet! And it’s for meeeeeeee or maybe that nebulous gift bin I keep talking about since it sort of makes me look huge on top. Anyway. Mods: I did some extra shell rows and some extra collar rows. I also omitted the pompoms. 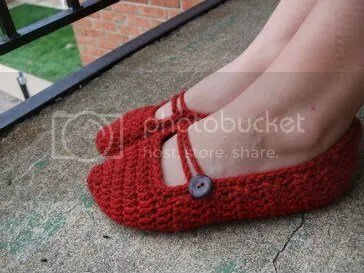 According to the Ravelry stash entry, I bought the yarn for this in October 2012. I got it at Tuesday Morning shortly after I moved up to DC. The intent, I think, was to make a sweater or a tutu, but I don’t think I would have had enough for that, even on huge needles, so capelet it is. I love a good capelet. I wear my Red Riding Hood capelet all the time and I keep meaning to make another similar one, perhaps sans hood. I’m not sure how keen I am on this one (the mohair halo makes me look huge and it’s not the softest yarn ever). Right now it’s keeping Elizabeth warm, which is a fine place for it to stay until I figure out if I want to keep it or not. It looks excellent on Elizabeth, as everything does, and decidedly less so on me. Hrmph. 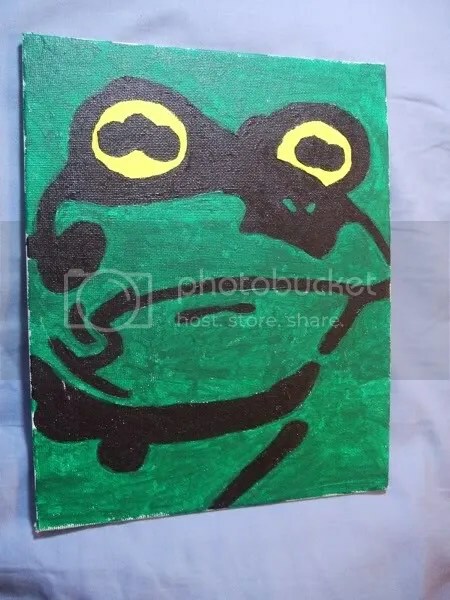 I did really like making it though. Crochet was the first craft I learned, the thing that started this whole crazy rabbit hole to several looms, a soon-to-be tax-refund-funded new spinning wheel, and literally thousands of dollars spent on yarn, and I don’t do it nearly enough. 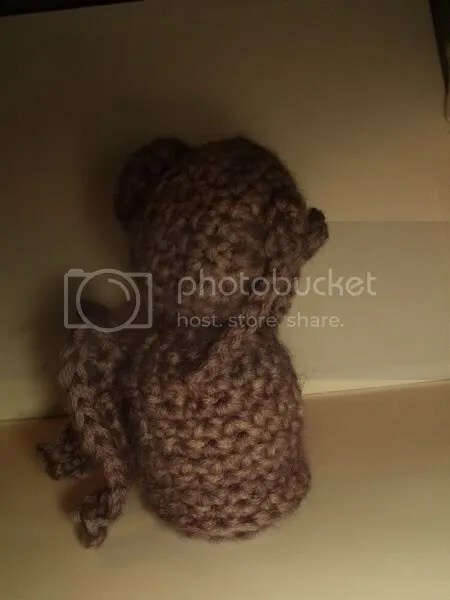 Mostly because I generally prefer knitting, as I don’t have to look at it to do it, unlike crochet, where if I don’t look, I end up poking the hook somewhere weird and not the next stitch, but still. 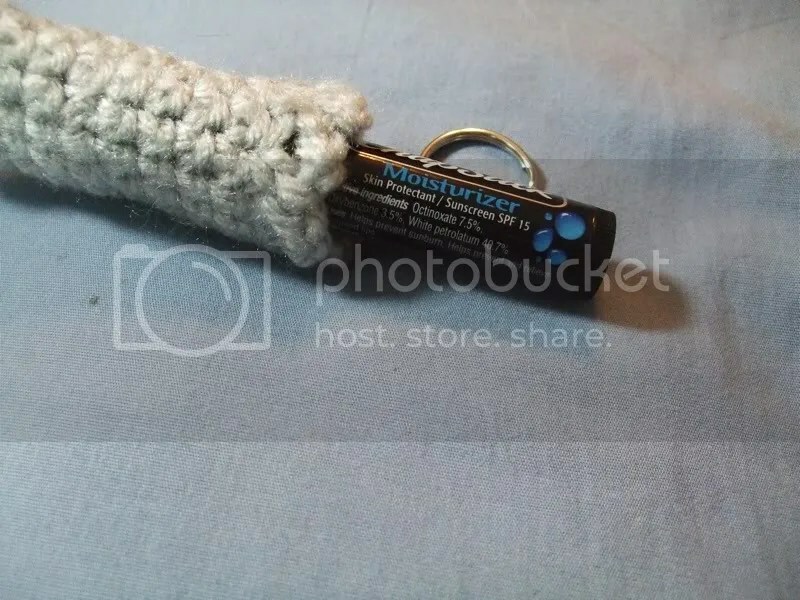 There are some applications where crochet really shines, and I should seek out more of them. (For one thing, crochet is excellent for quickly working through what some (not me) would argue is a slightly ridiculous yarn stash). 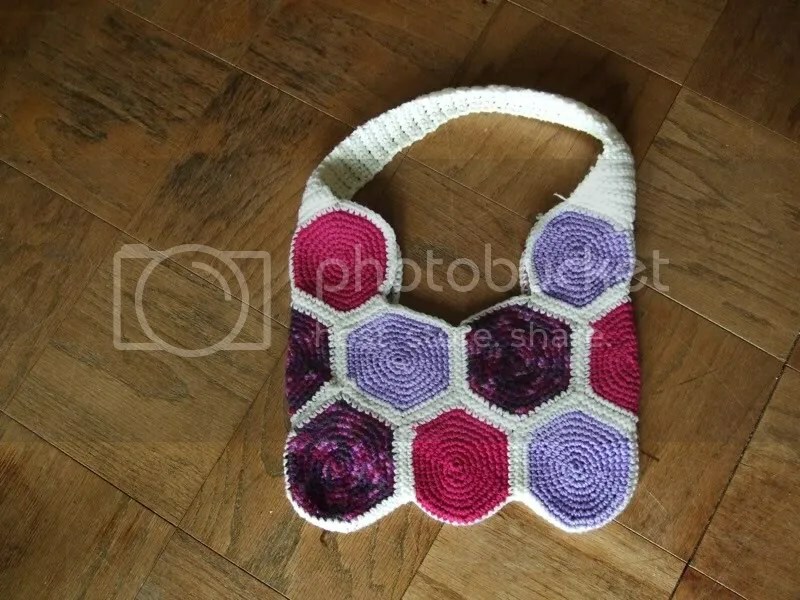 Crochet was my entry to crafts, and it will always be my first love. Maybe not my truest, but always my longest. Maybe I’ll start another granny square blanket. I do love a good granny square. Sooo I’ve started swapping again. I signed up for an Alice in Wonderland swap and I’m doing ows again. 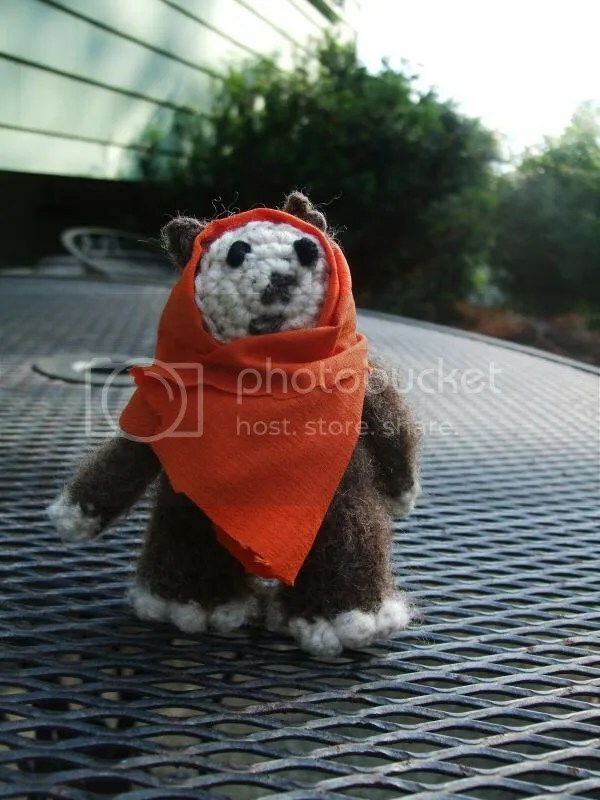 I claimed A2K for some plarn and an ewok pin cushion. 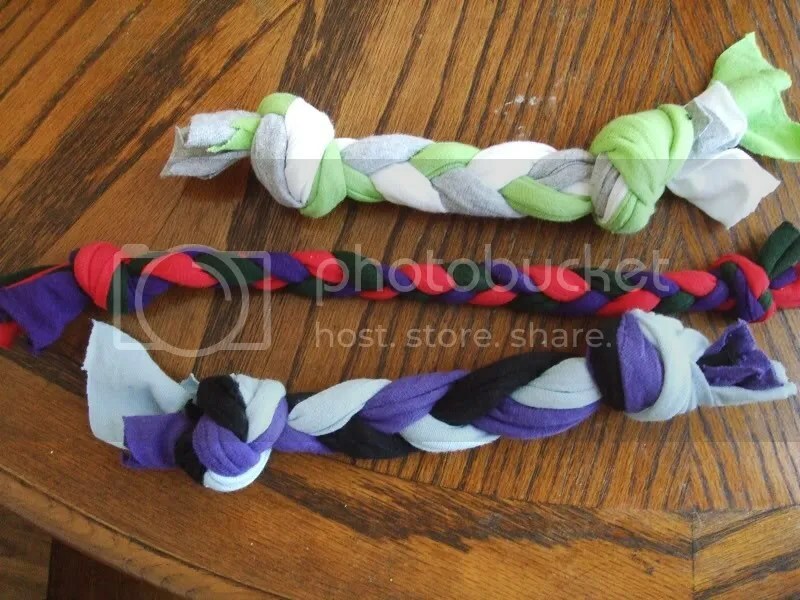 Plarn is a portmanteau of plastic bag yarn. 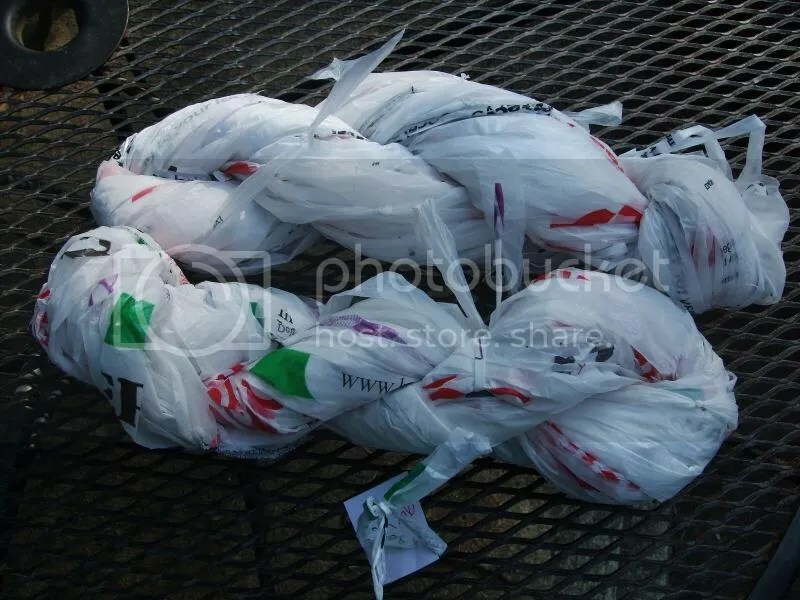 I used this tutorial to make yarn from the collection of plastic bags I’ve got kicking around. I got a total of 202 yards in two skeins. I used my rotary cutter to slice the strips and it actually went pretty quickly. I keep forgetting to bring my reusable bags when I go grocery shopping, so I’ve got quite the collection of plastic bags. 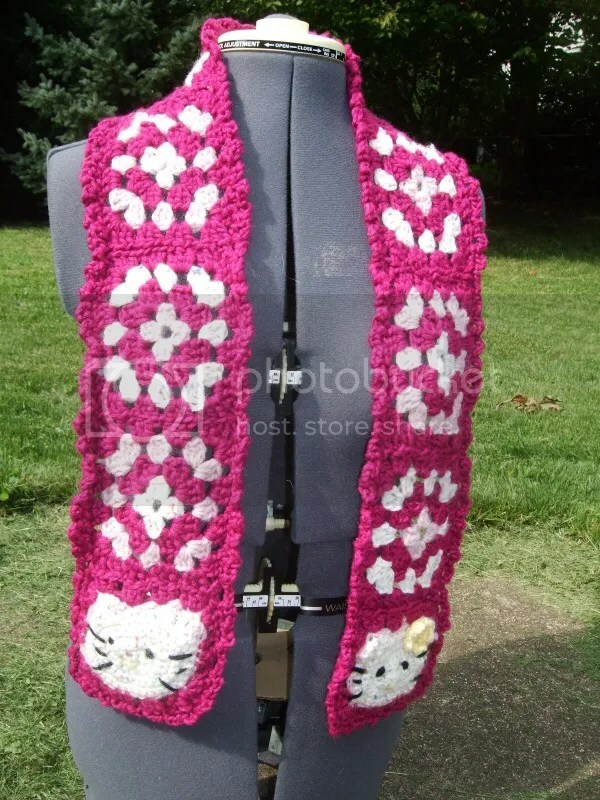 I might make some of this yarn myself and use it in weaving. 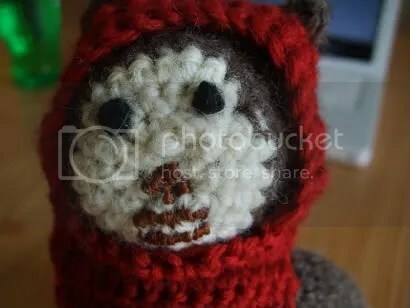 The other thing I made for the swap is an Ewok. Yarn: Scraps. Cascade Eco and wool recycled from a sweater with a bit of colorwork. Mods: I mostly made things up as I went, so there are a lot. Plus I used fabric for the hood and stitched it in place. 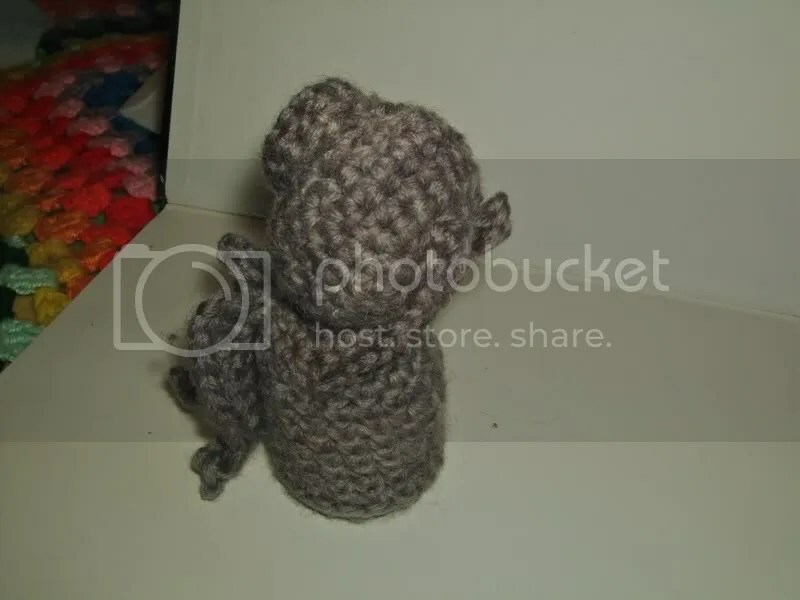 Once I finished all the pieces and stitched him together (mostly just the arms since I made the legs, body, and head all in one piece), I used a hand carder to brush out the yarn and make him fuzzy. He’s stuffed with yarn scraps from weaving, so he’s wool all the way through. I’m particularly pleased with the hood. I played with the fabric and draping for a while before I stitched it down. I tried to crochet the hood, but I kept running out of whatever color I started it in. I guess it takes way more than I was allocating. Oh well. The fabric hood came out really nicely. 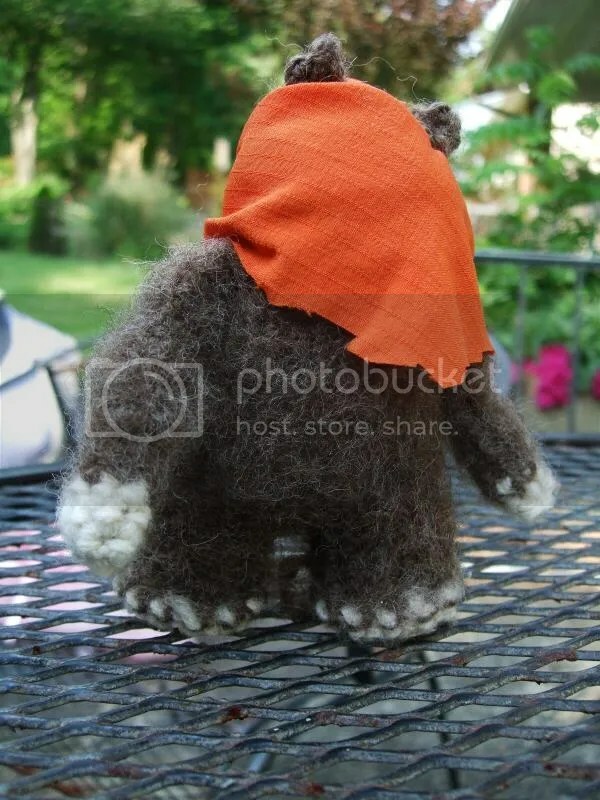 There’s a good chance that by the time this posts, the little ewok and the plarn will have made it to their destination. I hope A2K likes them! 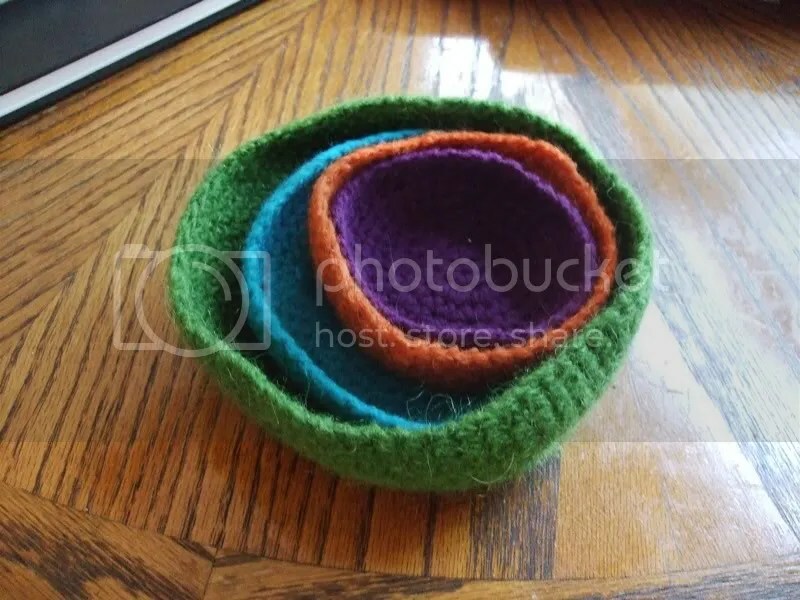 Here is the second thing I made for the Yarnies/Hoopers swap. It’s crochet because sometimes I do that too. Mods: Oh so many. I followed the directions for the kitty faces sort of but I know how to make a granny square. I didn’t do the oblong ones, I just made regular ones. I also added an extra square behind the kitty face squares. This is what the back of the Hello Kitty squares look like. I made two more squares but with one fewer round. Then I sewed them on and tucked all the ends behind it. That way I didn’t have to worry if my embroidery was messy or ends weren’t woven in perfectly. There’s a picot edge all around the outside which was probably the most time-consuming part. I like how it came out though. I gave the scarf a quick steam block before I sent it out to help everything lie flat. Here’s a close up of the Kitty square that isn’t awful. It’s the flower I think. 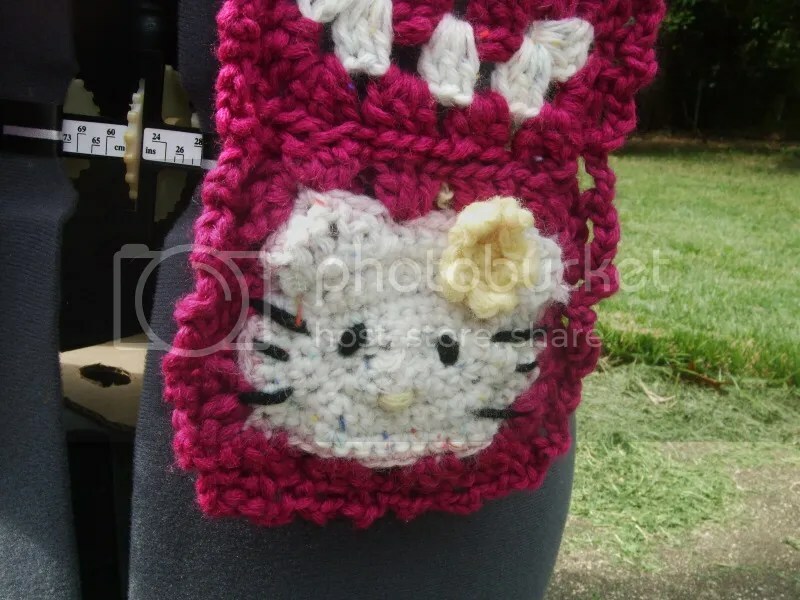 The other one is sort of misshapen but it looks more or less like Hello Kitty. 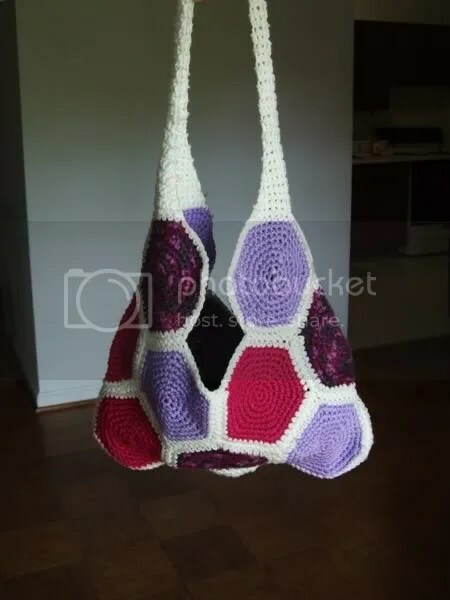 This project made me remember how much I enjoy crochet and granny squares. Might have to make something with that soon. So who else watched it? Because MY FEELINGS. For one brief, shiny moment near the end I thought everything was going to be okay and then Moffat was like “lol NOPE.” But I wasn’t crying yet so I figured I’d be okay AND THEN THERE WAS THE AFTERWORD. And there were tears. Because AMY. I’m barely coherent about it. I’m going to miss those two SO MUCH. Because Rory. RORY. Anyway. Next time on the blog will be some Doctor Who stuff from the Doctor Who swap. 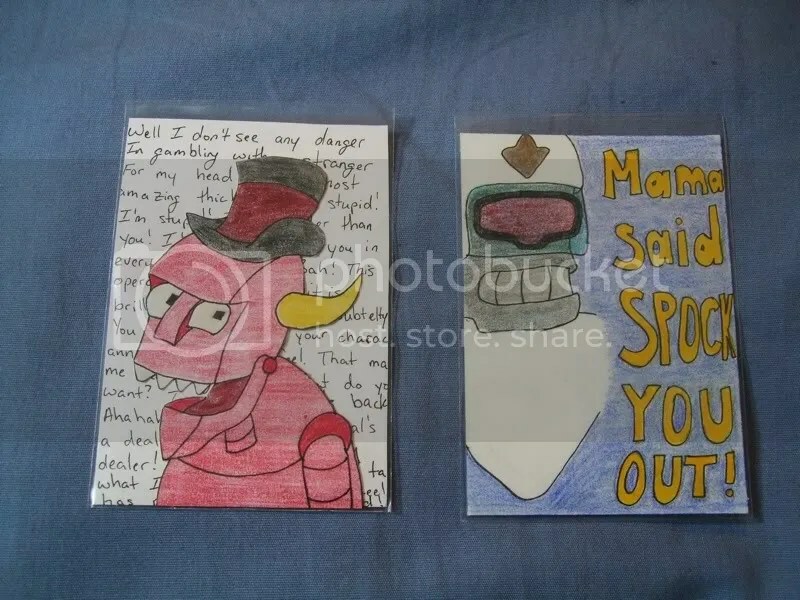 What I sent has been received for a while so I’m going to finally get around to posting pictures of what I made. Mods: I added an extra row of shells/3dc in ch1 sp. Woo! Pretty simple project; went by super quickly. And now we have a pretty bathmat. This next week will likely be spent cleaning and organizing and a little bit of job hunting. I’m applying to the Fairfax school system, which I likely won’t get but would be awesome if I did. Cheers! So I have this habit of cycling through sci fi franchises. The good ones I watch obsessively and welcome to the fold of my fandoms. 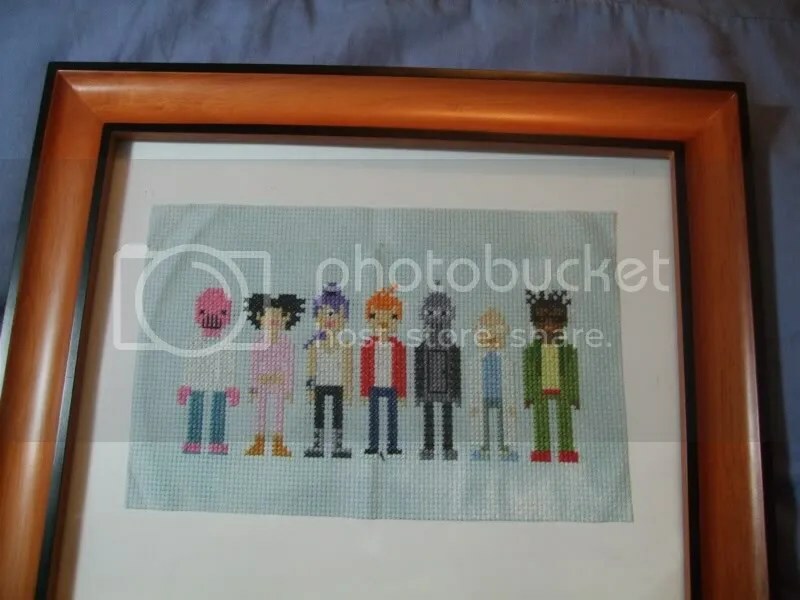 It is these shows which I continue to rave about, craft about, and obsess about. Among these franchises are SG1 and SGA (oh, how I love SGA), BSG, Harry Potter (of course) and Sanctuary (still ongoing but despite the protests of my inner biologist, I love that show to death. Mostly because of Amanda Tapping). In the past couple of weeks, I’ve welcomed a new franchise into the fold. Doctor Who. Oh, Doctor Who. I protested for so long even though my college friends were nuts about it. I saw part of 9/Rose episode on TV once and part of a Tom Baker ep at college and I didn’t care for it. It was odd, the special effects were terrible, the writing was disappointing. And then, a couple of weeks ago, I watched Blink. Mods: Worked the base attached to the body instead of separately. So I finished a thing for OWS. I actually finished several things but like a dummy forgot to take pictures and this one I haven’t sent off yet (so if you’re Quaggy on Craftster, you should probably not look). Pattern: I made it up as I went. Might put together a pattern. Might not. It’s pretty simple. Make hexagons. 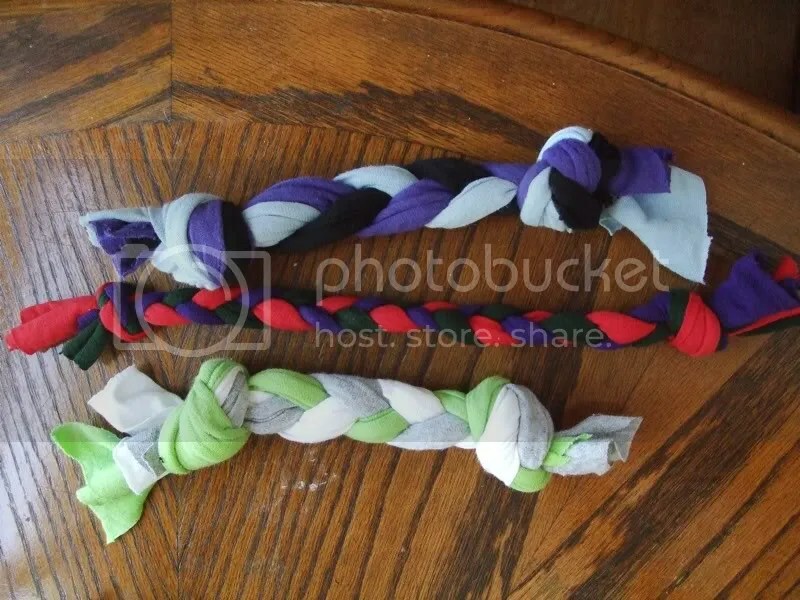 Sew them together. Make handle. Yarn: Acrylic from an estate sale (which I suspect to be Red Heart Super Saver). The purple multi is Jo Ann Sensations Rainbow Boucle, which I actually bought at Jo Ann’s a few years ago. Cause I’m classy. 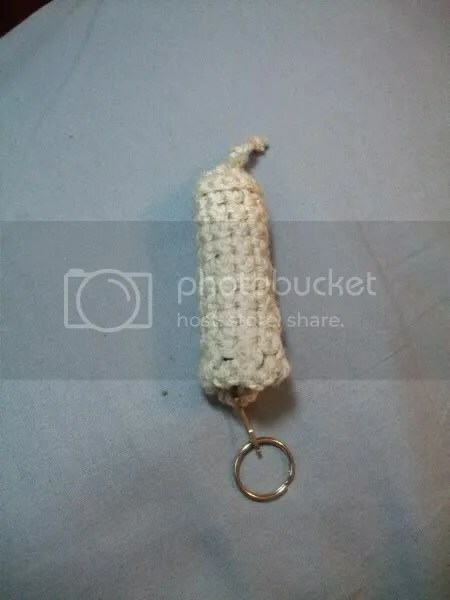 Hook: (yep, this is crochet! Gasp!) I/9 5.5 mm. I crochet kind of loosely though. I lightly steamed the body of the bag to make it less stiff, but the gauge is tight enough that I don’t think it needs a lining. I didn’t steam the handle because I wanted it to be stiffer/more sturdy, and I think I accomplished that. I also finished another thing, knitted this time. 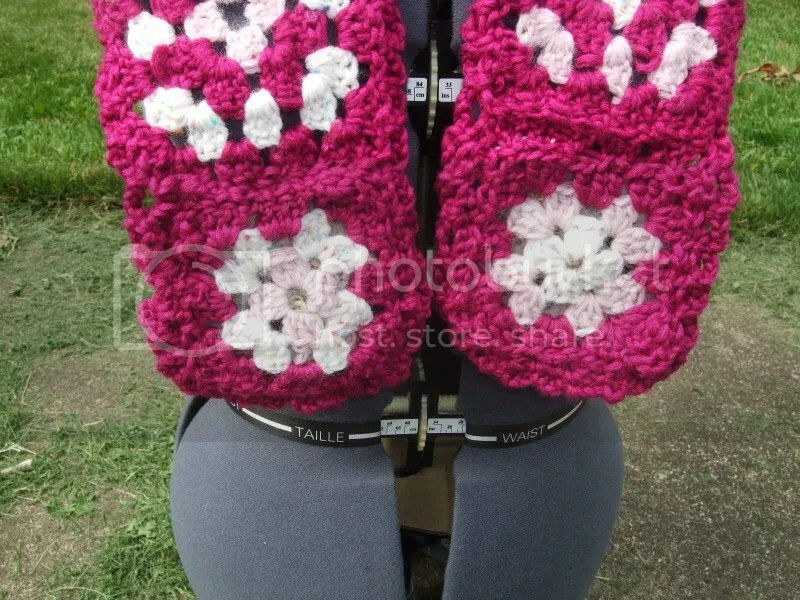 I made a shorter version of my Leah vest to work out the shaping (and also cause I wanted it). I still have to take proper pictures of it, so I’ll leave that for another post. In the mean time, I’ve cast on for a hat with a nice big brim for shading my face from the sun. 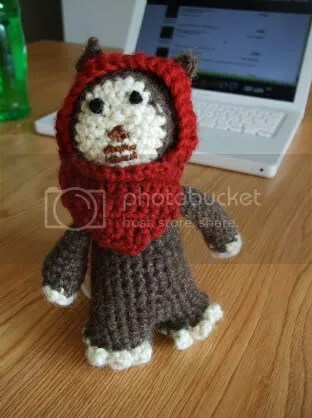 Pattern: Wicket the Ewok, mostly. Yarn: Cascade Ecological Wool (brown), cream wool from a thrift store sweater, and red-orange vintage wool that never ends. Hook: 3.75mm (f) and 4 mm when I misplaced the f hook. Mods: I didn’t really follow the pattern for the body or the arms and I didn’t use it at all for the head or ears (though the pictures were instrumental in my figuring it out). 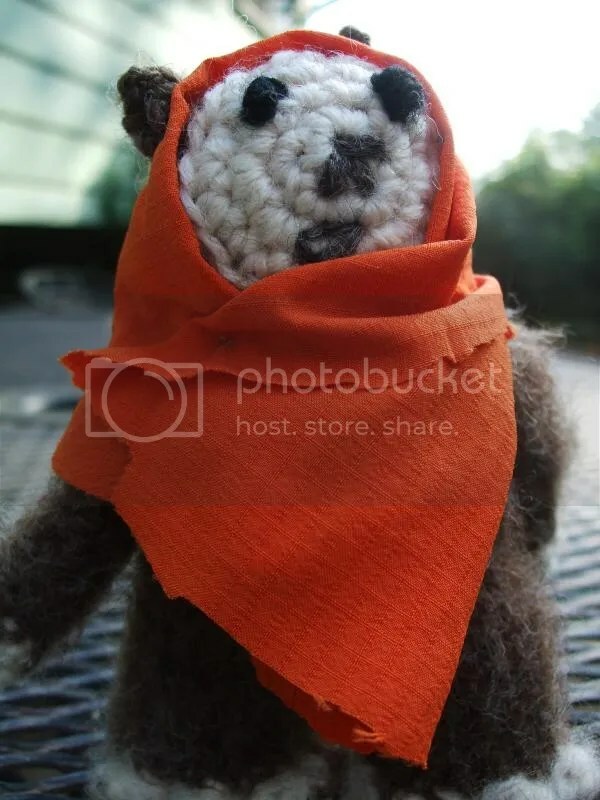 I followed the pattern for the hood, but I had to modify it so it fit my Wicket (it would have come out WAY too big). 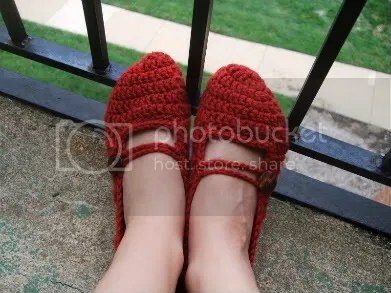 Pattern: Mary Jane Slippers for what seems like the hundreth time. Yarn: Vintage wool, which I’m trying desperately to use up since I’m not crazy about it. Mods: I don’t think any. 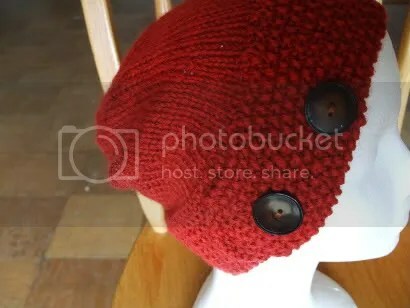 Pattern: None; I knit the brim flat and picked up stitches for the top part of the hat. Yarn: More of that vintage wool. I’m down to less than 50g I think. 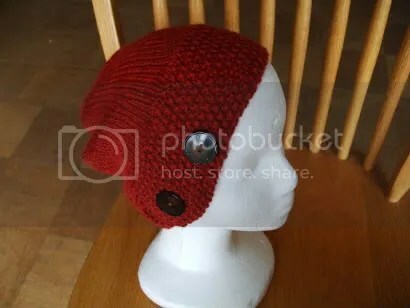 This yarn frustrates me (nothing wrong with it; I just don’t like the color and I had a lot of it), but I like how the hat came out. It’s cute. I love seed stitch. : ) Not much to say about it; it was pretty easy to make. 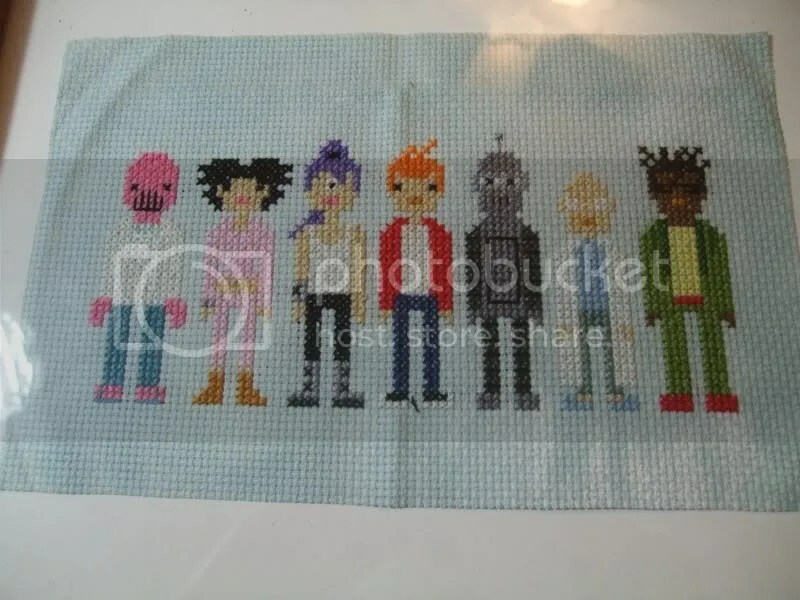 In other crafting news, I recently received a crap ton of fabric from an OWS claim, but I’m waiting on one more OWS package, so I’ll just show you all at once. I’m also knitting up some swatches for a WWYF swap (one in linen stitch ❤ and one in stockinette) for which I received a lovely shawl pin. I'll show you that when I show you the OWS stuff. I also recently finished a thing for a friend's birthday, which I will try to show you on Monday. It's super cute.